Syllabus of the Online Course (Subject): Forum on China-Africa Cooperation (Trade and Economic Relationships) (FOCAC). Description of the Online Course: Forum on China-Africa Cooperation. 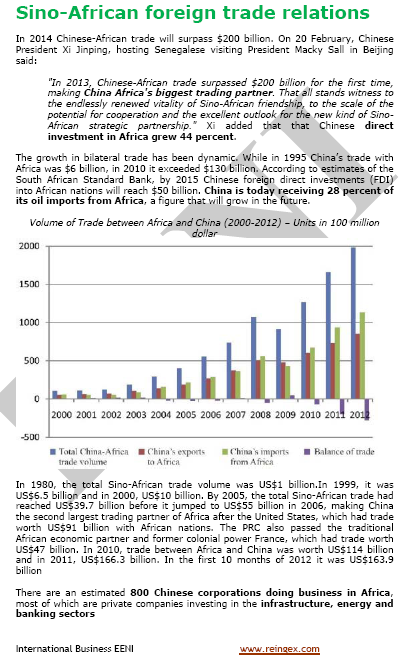 Since 2008, China is the largest trading partner of Africa. 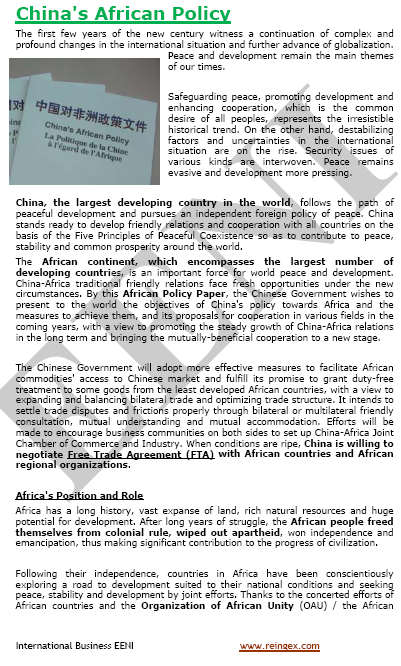 The Forum on China-Africa Cooperation is a platform established by the People's Republic of China (BRICS Countries) and African Countries for the common dialogue and a cooperation mechanism between developing countries (South-South cooperation). The main objective of the Forum on China-Africa Cooperation is to promote and assist to Chinese companies to do business in Africa: foreign direct investment, Foreign Trade, and cooperation. The Government of China has taken different measures including special funds and providing concessional loans. The Beijing Summit of the Forum on China-Africa Cooperation adopted a declaration in Beijing, proclaiming the creation of “a new type of Strategic partnership” between the People's Republic of China and Africa. The Forum on China-Africa Cooperation members are the People's Republic of China, Algeria, Angola, Benin, Botswana, Burundi, Cameroon, Cape Verde, the Central African Republic, the Comoros, Congo, the Democratic Republic of the Congo, Djibouti, Ivory Coast, the Arab Republic of Egypt, Eritrea, Ethiopia, Gabon, Ghana, Guinea, Equatorial Guinea, Guinea - Bissau, Kenya, Lesotho, Liberia, Libya, Madagascar, Malawi, Mali, Morocco, Mauritania, Mauritius, Mozambique, Namibia, Niger, Nigeria, Uganda, Rwanda, Senegal, the Seychelles, Sierra Leone, Somalia, Sudan, Chad, Togo, Tunisia, South Africa, Zambia, and Zimbabwe. The Forum on China-Africa Cooperation belongs to African Civilisation and the Sinic Civilisation.